Boundless has done it again! With success from the CF, CFV & the CFX Boundless Tech has yet to fail with their portable units that cease to amaze. The CFC is an efficient unit the company says is built for stealth. We would agree it is super compact (their smallest unit yet) with fast heat up time, a large oven capacity and it contends in the top of its weight class in vapor quality. This lower priced unit that retails at around $90 might even have the strength to battle with the big boys. Stealthy smooth classy and sleek with limited bells and whistles this unit is straight to the point. It is a great portable unit that fits in the palm of your hand comfortably. It’s rigid rubber casing and airflow design helps keep the device nice and cool where you grip it. It has 3 buttons POWER and 2 Temperature buttons (+ & -) with a small display screen for battery life and temperature. It has simple access to the oven through removing the mouth piece off the top of the unit and is very easy to pack you can scoop dry herb into the oven with ease. This decent size Ceramic Conduction oven can hold around .3 to .4 grams of dry herb easily. Located under the mouthpiece the oven uses Ceramic Conduction to combust your dry herb evenly every session with great quality vapor. Boundless says that the unit can last 12 to 15 sessions with a full charged battery (Sessions being 5 minutes long based on power up to automatic shut off). It’s possible depending on the temperature you are using it at, however we started each session at 385°F gradually increasing the temperature to 410°F and we were able to last 10 sessions with the CFC which is still in my opinion something to brag about. Along with it’s lasting battery life it also has a fast charge time. The CFC charged from completely dead to having a full charged battery in an hour and half to 2 hours. All in all the battery on this unit is more than decent for a portable unit and almost a steal at it’s price. This vaporizer like it’s cousins in the Boundless C series is very easy to use. You remove the mouthpiece at the top of the unit to reveal the oven, pack it with .25 to .4 of dry herb of your choosing (Boundless recommends to grind herb finely before packing but a little less than fine is okay as well as long as you don’t pack it too tight, as it can block the airflow) and put the mouthpiece back on. To power on the unit just hit the power button located at the bottom of the device 5 times rapidly and it will display the boundless logo on the display screen once it’s on. It heats up extremely fast, so fast that it is ready for use in 20 seconds after powering it on. Select your temperature with the 2 buttons located above the power button (+ & -). It is set to read the temperature by °C (Celsius) but if you would like to change it to read the temperature by °F (Fahrenheit) simply press the “+” & “-“ temperature buttons at the same time and it will change immediately in the display. Once it heats to desired temperature it’s ready for use. Enjoy! The little smooth sleek monster priced at $90 dollars is a FANTASTIC buy. This is a GREAT unit for first time buyers as well as experienced dry herb vaporizer users. 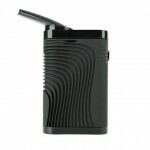 It’s extremely easy to use, efficient, truly portable in it’s small size, has fast heat up time and produces excellent vapor quality to enjoy at home or on the go. The only negative thing I would say about the CFC is that the mouthpiece does get a little hot with extended use of the device, not unbearably hot but enough to notice. It’s understandable since the ceramic oven is located directly under it and it is something we come across in most dry herb vapes. 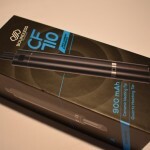 As for other Vaporizers in it’s weight class I would say the CFC in my opinion is top of it’s class and the only way to maybe get a better product would be to jump up to the $250 to $300 price range. If you have $100 to spend and you are looking for a dry herb vaporizer this is most definitely a product you will not be disappointed with. 2017 710vape.guide - All rights reserved.